Are you planning a public movie event? You need to understand movie licensing, costs involved and ways to save on the licences. Good news – no licence is required to show films in your backyard to your family and friends! Any event beyond your backyard, including free events, is subject to licensing. Non-compliance may cost you up to $250,000, so read on to avoid the penalty! Where do I obtain licences? In Australia, Roadshow PPL represents the majority of film studios and film distributors, including Warner Bros, Universal, Paramount, 20th Century Fox, and Walt Disney. Amalgamated Movies are non-theatrical film distributors for Sony Pictures (Columbia Pictures and TriStar Pictures), and others. Contact these licensors and request permission to screen two or three movies, in case the first choice film is not yet available for public performance. Most of the movies are available for non-theatrical screening events only several weeks after DVD release. Public performance of music requires a separate licence. Contact Australasian Performing Right Association (APRA) and Phonographic Performance Company of Australia (PPCA) for details. 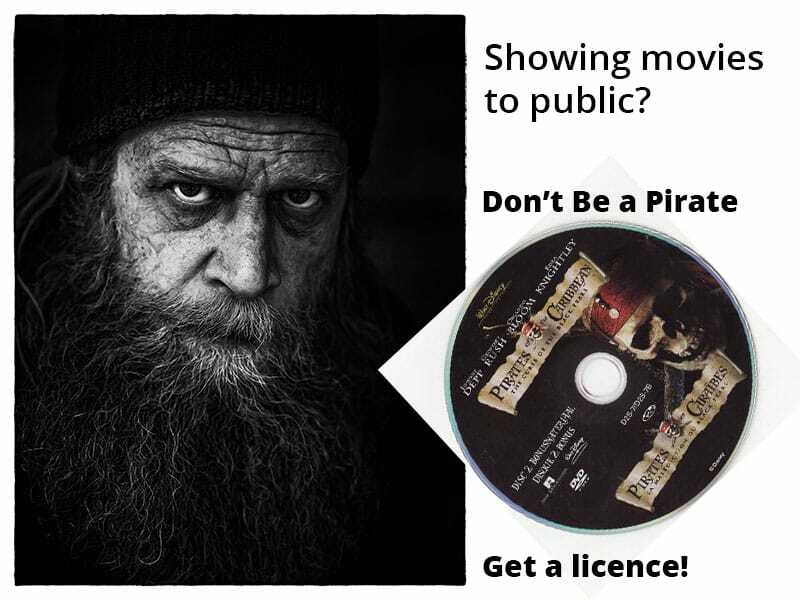 If you are planning to show movies to the non-paying audience throughout the year, you may be eligible for a blanket licence. Blanket licence is paid once a year and gives permission to show films all year round – no need to pay for each film! Budget several hundred dollars for a yearly licence, depending on your location and on the size of your audience. For a one-off event, the costs for a standard movie licence vary from $300 to $1000. A country primary school will be on the lower end of the scale whilst a commercial organization will be on the higher end of the scale. Organising a ticketed event? Prepare for the minimum flat fee or for 30-35% of your ticket sales, whichever is greater. When planning an event, contact the licensing officials for the quote and mention all details of the event to get the accurate costs of movie licensing. What are the options to minimise costs when organising events on a big screen? Some film distributors are cheaper than others. Amalgamated Movies can be more budget friendly. Choose among films made by Sony Pictures (there are some excellent kids’ movies and adult classics on offer!) or look through their range of Australian movies, anime, Bollywood, Asian Cinema and independent films. Screening Art House films will cost you far less than recent Hollywood blockbusters. National Film and Sound Archive offers to loan the films pre-licensed for non-theatrical and educational screenings. For as little as $22 dollars, show such films as Babe. Pig in the City, Cinderella, Bran Nue Dae, Happy Feet, Mao’s Last Dancer, and others. The restrictions will be for indoor spaces only. You also need to meet the NTLC terms and conditions of loan available at: http://www.nfsa.gov.au/collection/screening-loans/. Consider showing documentaries – great way to educate community, and often, a very affordable one! For example, “Edible City”, a documentary on sustainable local food system, will only cost $125 for local government or $39 for the library! Christian camps and schools can obtain yearly licence via their Church, at very reasonable rates, via Heritage Films or via Church Video Licence. Schools should check if they are covered by the co-curricular licence, which allows showing films for entertainment purposes. Unfortunately, this licence does not allow screening films for general public and for fundraising activities. Watching live to air TV, including free to air films, footy finals, state of Origin matches, or Olympic games, does not require licensing. All you need is a set top box connected to the projector. Replay of these events, however, may require a licence. Youth can play computer games on inflatable screen – this activity normally does not require licensing as well. Finally, to organise a public movie event, you need equipment. We provide both projection screens and complete portable cinema packages. Check our store to find the cinema equipment for your audience. I have 500 acres 1.20 mins outside Melbourne. I currently have a camping farmstay business and I wish to express my other passion which is movies. Hi Steven, great idea – we’ll get in touch with you personally to advise. I have a passion for movie and a venue to show them . I can advise you that you would need to contact The distributor of the said movie you wish to screen, however we have no connection to them- we simply supply AV and screen equipment. If you are looking for a system to show movies on I can definitely help you. In order to screen movies publicly you need to obtain a license from the distributor of the film, regardless of if you are charging or it is a free event, there will still be a small fee. How and where would I apply for a blanket licence? How do I find out more details on blanket licence. We are a very small remote outback community wishing to show movies at no charge to our patrons. Nearest cinema is at least 350 km away. Hi Leanne, if you head over to the Roadshow website – https://roadshowppl.com.au/wpLicence/LicensingOptionBlanket.aspx , it lists information regarding the blanket licences. You can also send through an enquiry directly and they will be able to establish which type of licensing is best applicable. Universal Jurasic World Fallen Kingdom is a recent movie release on DVD. I run a Rotary Youth Group of 15 students and we wish to have the movie shown for us at the newly upgraded Batlow Literary Institute following our Christmas BBQ pool party at the local pool. Is there a special license we can gain to do this. Hi Margaret, you can acquire a single-screening licence for the purpose of a one-off movie screening. Have a read through the Roadshow website – https://roadshowppl.com.au/wpLicence/LicencingGeneral.aspx and click ‘Request a public performance’to apply for the license. Hi there, we’re a theatre group with our own theatre and screening equipment and we want to start showing classics and art house films. Can I talk to someone about how to get this off the ground? Would imagining charging patrons around $5 a ticket. Hi Michael, you may be able to apply for a blanket licence if your screening movies on a regular basis. Depending on the films your planning on showing will determine whom you need to get licences from. Additionally, licencing costs are generally higher if selling tickets to patrons. Check out https://roadshowppl.com.au/wpLicence/LicencingGeneral.aspx for more information.